Walls looks like a simple book. It has 13 pages of text and a few more pages of art. The poetry varies from stanzas with an abcb pattern to abcc, abbb, aaba, abca, and anything else one can imagine. The bad walls are made of concrete and keep out people. The best stanza in the whole books is: These walls are unfriendly,/ and perhaps even rude./They block new adventures/with their bad attitude./ The human on that page is shedding tears. The last third of the book is a rally cry to come together. /These are the walls we like least of all./ The author repeats it three more times. He explains how people can work together until those walls come tumbling down. The second to last double page spread shows eleven people and one mouse— male, female, tall short, black, white, red-haired, blond, one with a hijab, in a conga line kicking up their heels on their way to working together for a better world. The only thing missing is a human in a wheelchair. The orange cover pops with the title in white. The walls on the cover are falling down like dominoes, the end papers are brick walls, and upon a second read, one sees that the mouse is shown on the cover and every page except two. The art is spare, in primary colors with black accents and occasional gray. The mouse gets its own house on the buildings page. 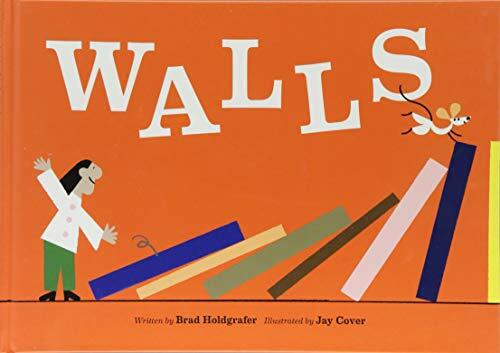 Walls is a book for our time as a divided nation. The author does not agree with the current administration’s plan to build a wall along our southern border. Sometimes the simplest books have the most to say.